This book offers a unique multi-disciplinary perspective on tackling health inequalities in a rich country, examining the New Labour policy agenda for tackling health inequalities and its inherent challenges. 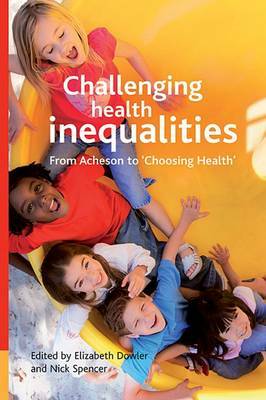 The book presents an overview of progress since the publication of the seminal and ambitious 1998 Acheson Inquiry into health inequalities, and the theoretical and methodological issues underpinning health inequalities. The contributors consider the determinants of inequality - for example, early childhood experience and ethnicity - the factors that mediate the relationship between determinants and health - nutrition, housing and health behaviour - and the sectoral policy interventions in user involvement, local area partnership working and social work. Challenging health inequalities offers a combination of broad analysis of progress from differing perspectives and will be key reading to academics, students and policy makers.